The Leading Swiss Provider of Traditional Chinese Medicine. Our mission is to enable individuals to restore and maintain health with Traditional Chinese Medicine. 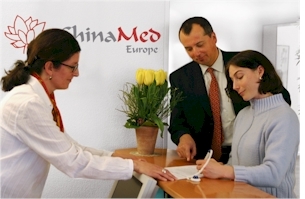 ChinaMed Europe AG is a provider of Traditional Chinese Medical centers. Traditional Chinese Medicine (TCM) is a 3000 year old form of medical treatment which consists of five basic disciplines: acupuncture, herbal treatments, massage, nutrition, and exercise. In a ChinaMed Center, TCM is practiced exclusively with experienced Chinese doctors, recruited in China. With fourteen existing Centers located throughout Switzerland, ChinaMed is the leading provider of TCM in the country, administering over 100,000 treatments per year. Based on the experiences gathered from these successful centers, ChinaMed Europe selectively expands this model into additional countries. ChinaMed is deeply rooted in Chinese culture. Our Swiss/Chinese founders have 30 years of experience and ties to the Chinese medical community which inspired them to create the first ChinaMed Center in 1997. ChinaMed was the very first European partner of the World Federation of Chinese Medicine Societies, which is under the Chinese Ministry of Health. Copyright © 2006 ChinaMed Europe. All rights reserved.